For the present-day Panmunjeom Truce Village between North and South Koreas, see Joint Security Area. Panmunjeom, now located in Kaesong, North Hwanghae Province, North Korea, was a village just north of the de facto border between North and South Korea, where the 1953 Korean Armistice Agreement that paused the Korean War was signed. The building where the armistice was signed still stands. Its name is often used as a metonym for the nearby Joint Security Area (JSA), where discussions between North and South Korea still take place in blue buildings that straddle the Military Demarcation Line. As such, it is considered one of the last vestiges of the Cold War. The site of the former village is 53 kilometers north-northwest of Seoul and 10 kilometers east of Kaesong. The village, a small cluster of fewer than ten huts, is on the south side of the Kaesong-Seoul road on the west bank of the Sa'cheon stream. Meetings of the Military Armistice Commission took place in several tents set up on the north side. 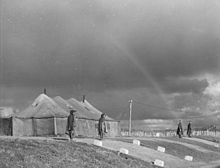 After the Armistice Agreement was signed, construction began in September 1953 on a new site, the JSA, located approximately one kilometer east of the village. All meetings between North Korea and the United Nations Command or South Korea have taken place here since its completion. The JSA is often referred to as Panmunjeom. After the war, all civilians were removed from the Korean Demilitarized Zone (DMZ), except for two villages near the JSA on opposite sides of the Military Demarcation Line. After that, the empty village of Panmunjeom fell into disrepair and eventually disappeared from the landscape. There is no evidence of it today. However, the building constructed for the signing of the armistice has since been renamed by North Korea as the Peace Museum. The world's fourth tallest flagpole flying a 270 kg (595 lb) Flag of North Korea, is 160 m (525 ft) in height, over Kijŏng-dong ("Peace village"), near Panmunjeom. United Nations forces met with North Korean and Chinese officials at Panmunjeom from 1951 to 1953 for truce talks. The talks dragged on for many months. The main point of contention during the talks was the question surrounding the prisoners of war. Moreover, South Korea was uncompromising in its demand for a unified state. On June 8, 1953, an agreement to the POW problem was reached. Those prisoners who refused to return to their countries were allowed to live under a neutral supervising commission for three months. At the end of this period, those who still refused repatriation would be released. Among those who refused repatriation were 22 American and British POWs, all but two of whom chose to defect to the People's Republic of China. A final armistice agreement was reached on July 27, 1953. The United Nations Command, Chinese Peoples Liberation Army, and North Korea Peoples Army agreed to an armistice ending the fighting. The agreement established a 4-kilometer-wide demilitarized zone along the armistice line, effectively dividing Korea into two separate countries. Although most troops and all heavy weapons were to be removed from the area, it has been heavily armed by both sides since the end of the fighting. Wikimedia Commons has media related to Panmunjom. Wikivoyage has a travel guide for Panmunjeom.